Wedge Worldwide loves Weleda, a German company that produces extremely clean and natural body care products, and we are in the process of bringing in some of their new personal care items! We wanted to highlight a few of our favorites: the Calendula Baby Shampoo and Body Wash (great for adults too!) and the Baby Starter Kit, which is filled with an array of wonderful calendula products for baby. All Weleda Baby Care formulas have been developed with the assistance of physicians and midwives so you can rest assured that these products are a gentle and wholesome choice for your little ones. These products are a great way to care for your baby or child's ultra-sensitive skin. As a baby develops, so does the protective layer on his or her skin. An infant's skin is five times thinner than an adult's, making it especially sensitive to irritation and environmental influences. Weleda Baby Care helps to wrap a child in a layer of warmth and protection, supporting healthy and harmonious development. Both of these items are made with Fair Trade calendula flowers! Commonly referred to as marigold, calendula is an annual herb from the sunflower family. These flowers blossom under intensely warm sunlight. This vitality is captured in Weleda's fresh-from-the-garden, soothing and healing formulations. Native to central, eastern and southern Europe, calendula is made up of single, yellow to bright orange colored flowers containing caroteniods, flavonoids and essential oils. This gentle and nourishing botanical possesses powerful healing and anti-inflammatory properties. Approximately 800,00 biodynamic calendula flowers are hand-picked from the Weleda garden each year for the Weleda Baby Calendula Care formulations. Weleda's Medicinal Plant Garden in Germany is the largest biodynamic garden in Europe. Biodynamics is a holistic form of agriculture that takes into account everything from the cycles of the moon and the stars to the soil, plants, animals and people, with the ultimate goal of making each garden or farm a healthy self-sustaining ecosystem. Many people consider biodynamics to be a big step above organic products. As one of the pioneers of biodynamic agriculture, Weleda continues to develop and practice this holistic and uncontaminated method of farming. All ingredients are harvested according to the highest standards and under the strictest quality control guidelines. Located side-by-side with Weleda's production facilities, all plants can be picked and blended into tinctures that will be added to their products within the same day. 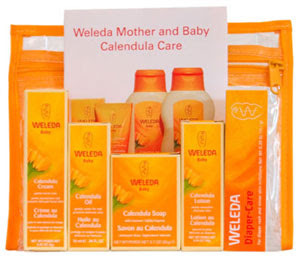 Some of the other Weleda baby care products Wedge Worldwide carries include calendula lotion, baby cream, diaper care and bar soap. Free Books For Blog Readers!